On August 19, 2017, 11:15 am, it finally began with an opening speech by Dan, who fanned the excitement. Furthermore, two representatives of the New York State government came to laud PLAY NYC. In attendance were Howard Zemsky, the CEO of the Empire State Development Corporation (ESDC), and Senator Martin Golden from the New York State Senate, both of whom emphasized the importance of supporting the growth of the video game industry in New York. While there’s no doubt that New York will have to compete to claim its place as a prime location for video game developers, they’re confident that the state will be successful. In a brief interview with OPN, Senator Golden stressed that all the components for growth exist: start-ups, space, and talent. Golden stated, “That talent [at the moment] is leaving us, leaving us in droves. They’re going to the other locations, they’re going to Texas, and they’re eating our lunch. I think we will be able to hold them here if we move along with this 3-prong-approach.” The approach he was referring to was to support the gaming industry through a bill that would offer a 30% tax credit for video game startups, investment in education, and improvement of the conditions for start-up companies. Right off the bat, there is exuberant optimism, but also an awareness that the landscape of video game development in the U.S. and worldwide is marked by fierce competition between locations for a share of the $30.4 billion total revenue in the U.S. — and $90.1 billion worldwide. Hyped by the pep-talk talks, I dove into the crowd. The convention took place in Terminal 5, which offered three levels for booths with a center stage on the ground floor for video streams and discussions. There were roughly one hundred exhibitors in total, who ranged from AAA studios to one-man developers. The studio with the most mainstream notoriety was probably Avalanche, who launched Just Cause 3 in 2015 and is now coming forth with theHunter: Call of the Wild. 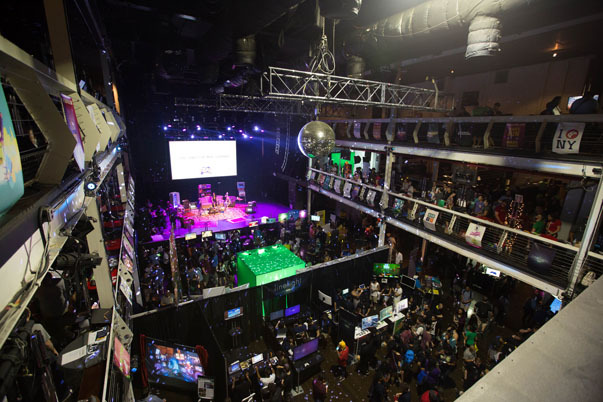 First and foremost, however, this was an event for small studios, who form the majority of the members of the indie gaming scene in New York. There was Eppy Games, with their title Dirtbag MotorClub, a comical mix between a racing and RPG-title that engages through its fast pacing. On the ground floor, I encountered the palpable enthusiasm of the team from Eos Interactive who surprised me not only with their VR-title The Take, which is currently still in development, but they also have an upcoming project that consists of documenting the creation process of a video game from A to Z. Initiatives like this bring transparency into game development that for many still appears to be an inaccessible field of endeavor. As my editors and I were stalking the aisles, looking for that indie game video hit that was still a prototype but would go on to revolutionize video gaming as we know it, we scanned the booths. Suddenly, two guys approached us who had come to PLAY NYC from Boston, did not have a booth, but took the convention as an opportunity to create buzz for their game Cede. They were Edwin and Kris from the studio BareHand. At first, I thought cynically, all right, I’ll bite, let me see what you got. When they showed us their game, after having set up their laptop on a makeshift counter, I was humbled. These guys have the product to back up their guerrilla marketing approach. Excellent graphics and an innovative new take on action-RPG-gameplay. They’re truly talented guys who, even without a booth, are making the most of PLAY NYC. This was the indie spirit which captivates me and which I had encountered before on a trip to research the indie gaming scene in Mexico City. The development side of video games was well represented, moreover, the side that game devs struggle with had a presence, too: publishing. Among the publishers were Alliance Digital Media, who presented a title they took on called The Norwood Suite. Having publishers at the event talking to visitors takes a little bit of the mystery out of the process of getting published, which often overwhelms young studios. This publisher has a pretty straight forward approach: either you can pitch games to them on their website, or you can drop by at their office in New York City. The educational institutions Gloden and Zemsky regarded as so essential were also present at PLAY NYC. The NYU Game Center offered insight into its academics and promoted its degree in game design. Recently, the college was selected by the ESD as the recipient of a $450,000 grant that helps to establish a Digital Gaming hub in Brooklyn. Specifically for PLAY NYC, Playcrafting recruited electronic media artists from the community and commissioned them to create video game installations. Some of the results were Salmon Roll by Andy Wallace and the interdisciplinary creative researcher Jane Friedhoff, a tongue-in-cheek interactive simulation of salmon swimming upstream, or Forest Cup by Ivan Safrin — both docents of Game Design, the first at LIU, the latter at NYU. 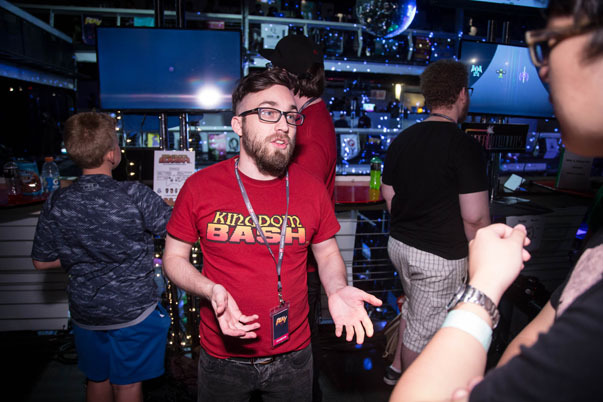 The substance behind the flashy buzz of screens and game tunes at the booths was provided by the talks and the speakers on the large and cozily furnished central stage. Among the most illustrious names was Patricia Vance, the President of the Entertainment Software Ratings Board, who was invited to speak about the growing relevance of age ratings for the ever-growing content in this industry. The composer Zac Zinger discussed music for video games and offered novel insights into the creation of a video game tune. When I was not testing games or listening to the speakers, I roamed around trying to take in as much as possible. I noticed a lot of families with small children, many of whom were heading for the rooftop. There, Come Out and Play, an organization who engages players outdoors with live-action street games, set up a real-world play area. The kids could tucker themselves out so that, after a long day herding children at PLAY NYC, mom and dad would finally be able to spend some quality time listening to Barry White. The roof was also the location of the afterparty on Saturday night. It was here where the work took place (after all, we do know that all play and no work makes Jack a poor boy). People came to mingle, small studios, big ones, publishers, press, speakers, and organizers — in a live-action socializing simulator. Press X to network, hold R1 to make a valuable connection. Here it was where I noticed the great hunger of indie developers in New York to get noticed and promote their games. On one of the two days of my attendance, as lunchtime neared, I realized that there were no places to get food in the vicinity. Senator Golden was right! Our lunches had been eaten — and probably by Texans! Desperately, I looked around and found some food carts conveniently located outside the entrance. There, I also had the chance to talk to a security guard: no incidents. The event had been a quiet convention with peaceful attendees. It was conspicuous that every stand had visitors who actually played the games; constantly. Not only were the exhibitors wishing to embrace the visitors, but the visitors showed an eagerness to get involved. It seemed like the majority of attendees came from NYC and I had the impression that this convention was a long-awaited event for New Yorkers who, in the past, had to make far hauls to the West Coast to get their fill of video game cons. All in all, this is no small-time meetup. 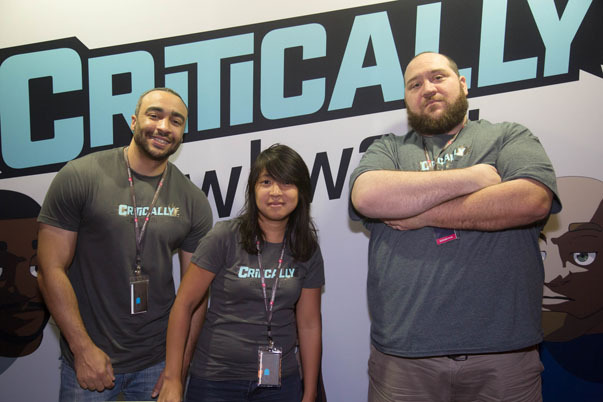 Thanks to the community around Playcrafting, we have witnessed a first promising event in hopefully a series of regular, annual, dedicated conventions showcasing the state of the art of video game development in New York City. With the right efforts by government, the community, and the citizens this state is well on its way to becoming a driving force for the video game industry on the East Coast.